Delphinium grandiflorum, Chinese delphinium, have a much different appearance and habit than the classic Delphinium. They are overall much shorter so they never need staking. It is a loosely branched plant that produces racemes of gentian blue flowers, but occasionally flowers will be white or even pink. The individual flowers are similar but are not produces on a tall spike. Blooming is prolific over a long period. Being much more heat tolerant, they are an excellent Delphinium for regions with hot summers, but will still appreciate some afternoon shade. Mulch to protect in winter in zones 5 and colder. This is an easy Delphinium to grow and care for, but still requires regular watering and feeding. Delphinium are a relatively short lived perennial and may only last a few years. Plan to replant or propagate from basal cutting. Division will produce new plants with an even shorter lifespan. Collecting and planting seeds or taking basal cuttings will take a little research and perhaps experience gained by trial and error. There are several fungal diseases and pests that may afflict Delphinium, but when grown in a sunny spot with good air circulation and well drained soil, the plant should stay generally healthy. Many of the Delphiniums are poisonous, all parts of the plant could be fatal if eaten. Water Requirements: Requires regular watering, do not allow the soil to dry out. Soil Requirements: Organically rich well drained soil with a neutral pH or slightly alkaline. Growth Habit: Mounded foliage with an open habit. Bloom Form: Asymmetrical with five petals. Pest and Disease Resistance: May be susceptible to powdery mildew, black spot, crown rot, aphids, leaf miners and mites. Fertilize: Apply a balanced liquid fertilizer every 3-4 weeks up until they bloom, and again after the spent blooms are cut back until they bloom again. Or apply well composted manure or a granular 10-10-10 fertilizer around the base of the plant in early spring and again after cut back. Do not over fertilize with high nitrogen, blooming period will be reduced. Maintenance: Remove flower stalks after blooms are faded to encourage rebloom. Divide every two to four years to preserve the health of the plant. Other: Deer resistant, attracts hummingbirds and butterflies. 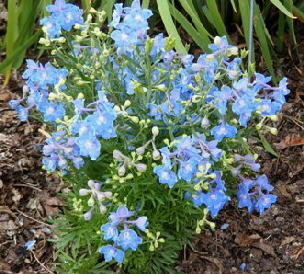 ‘Blue Butterfly’ blooms are a rich true blue, a unique color difficult to find in any annual or perennial. Hints of violet can be seen at the tips of some petals and the centers. The flower stalks are broad and branched. Flowers are held close to the foliage mound. Remove the flower stalks when blooms have faded for continued blooming to the end of summer. Do not remove the final blooms if you would like it to reseed. 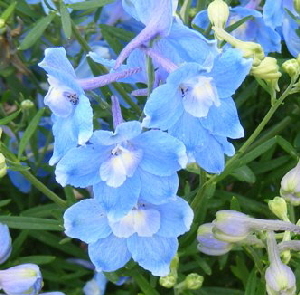 ‘Blue Butterfly’ has a short life typical of delphinium, so allowing it to reseed will keep it in your garden. If your garden bed is mulched, the seeds may have difficulty getting started. Plants grown from seed will bloom the first year. ‘Blue Butterfly’ has a bushy, but well behaved mound of foliage. It is a true dwarf so is perfect for front of the border. Also excellent as a container plant. Bloom Form: 1 1/2” asymmetrical with five petals. ‘Summer Blues’ flowers are a delightful powdery blue, floating in great quantities above lacy green foliage. The ‘Summer’ series of chinese delphiniums are the earliest to flower and have the best heat tolerance. Flowering is most abundant with a long day of sun, and with shorter days of sun the plant will be smaller and more compact. Deadhead spent blooms to encourage reblooming. ‘Summer Blues’ may have a delicate appearance but is hardy and quite heat tolerant compared to the classic tall delphiniums. This is a wonderful delphinium for containers and bedding plants. Can be grown fairly easily from seed and will generally flower their first year.